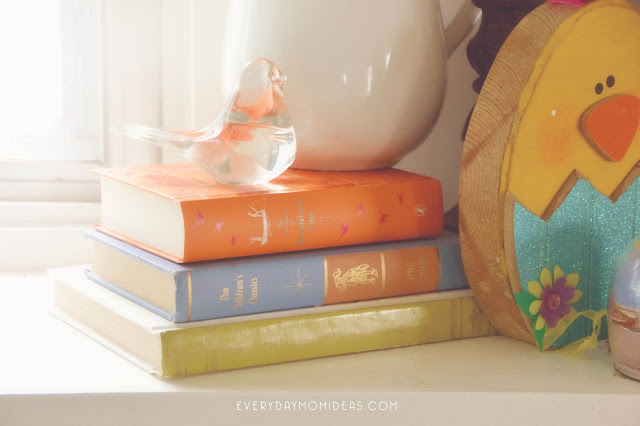 Decorating with children's books is a great way to utilize your books in different ways and save some major bucks on seasonal decor. Plus your kids will stay more interested in reading the books you have when they are featured in rotation around your home. My favorite season to decorate books with is Spring because one: spring color pallet is my favorite, and two: I feature the kids adorable spring books throughout the house. 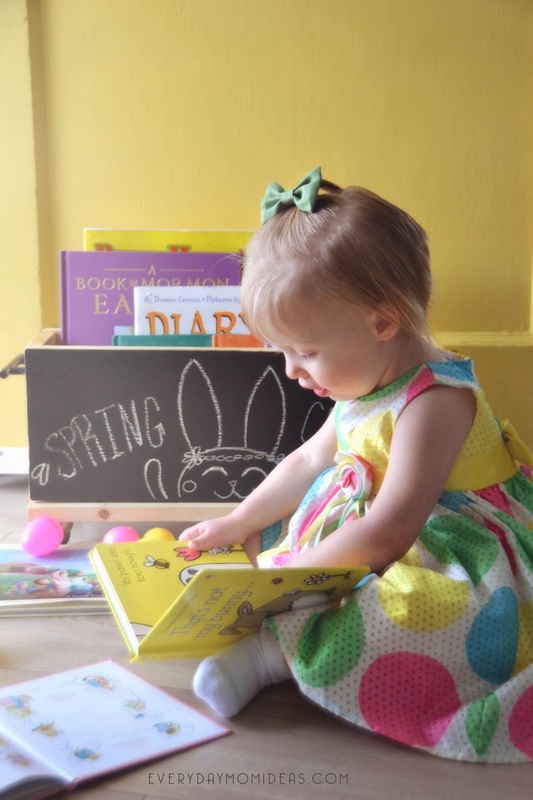 Here are some of the ways we store and decorate with children's books during Springtime and Easter with some creative containers, shelving and setups. 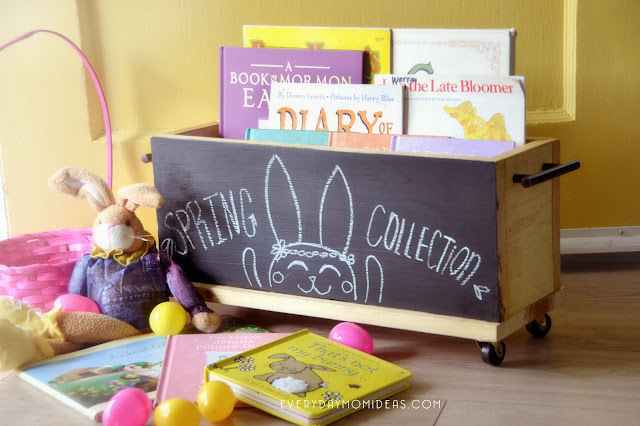 This is a Do It Yourself Chalkboard Book Box on wheels that we made last year and are totally in love with. You can make your own with this full step by step tutorial I made on a previous blog post. These book boxes are so handy especially for having right next to our toddlers bed for bedtime stories. And it has the extra bonus of being a chalkboard for different fun messages and encouraging reading. 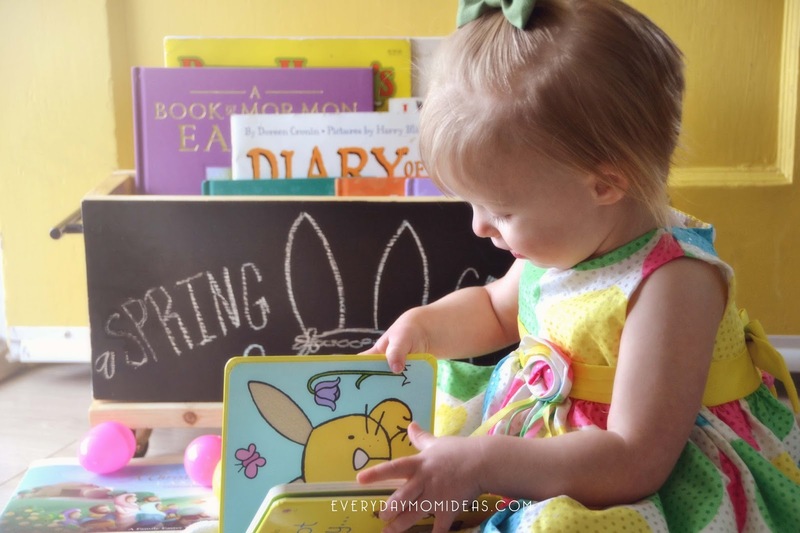 This spring collection of books are holding some precious spring themed bedtime stories. We also have this nifty antique crate that can be flipped on its side and if you put another crate on top it turns into a mini book case. These crates are so handy and we use them for all sorts of things like halloween decor on our porch, or photo props, even extra seating. Right now it's being used as our side table and library book storage. We try to keep our library books in one place. It doesn't always work. I also really love this basket. We have had this basket for ages and it's really well built and is one of the only baskets that have made it through all four of my kids. 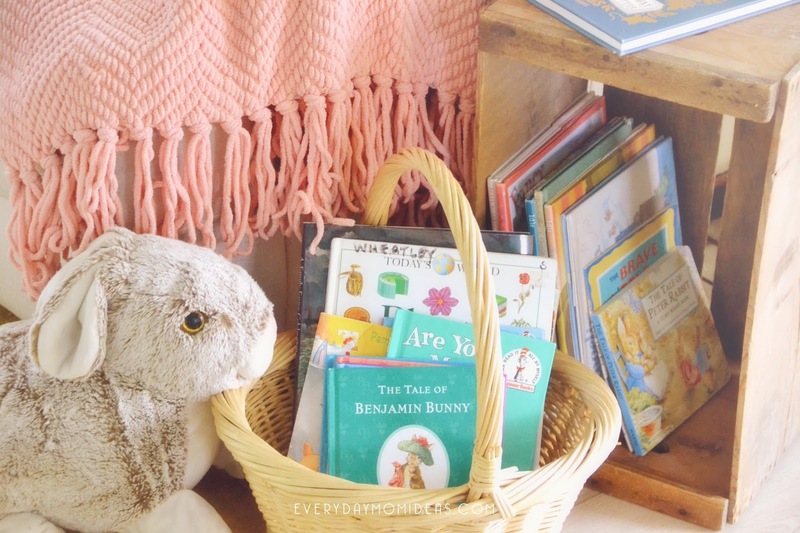 Baskets make a great book dump area. I totally recommend investing in a sturdy large basket for kids books. I love this shelf. I didn't think I would as much as I did when I bought it at a yard sale but it makes a perfect perch for children books and it keeps them out of the way of little hands that like to rip out pages so its perfect for the baby nursery. 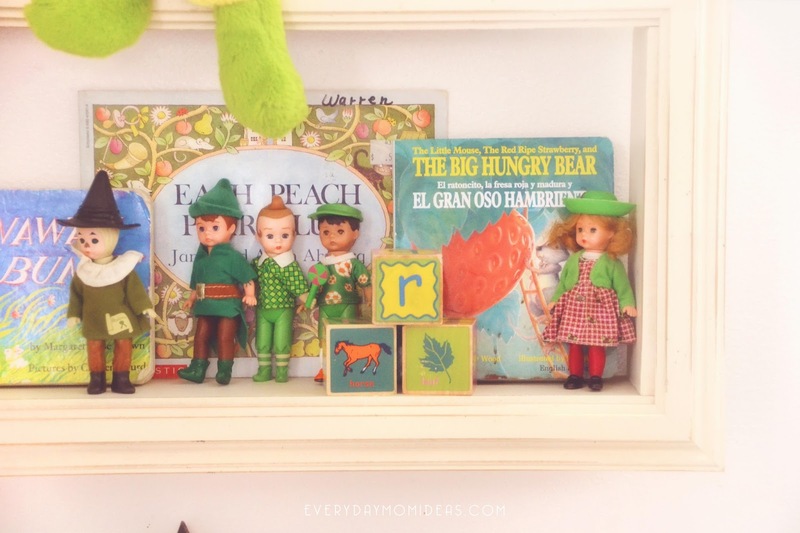 I like to feature some of their smaller toys with the books as well to give it that nursery flair. This is my tweenage sons room with his chalkboard wall. We like chalkboard at our house apparently. 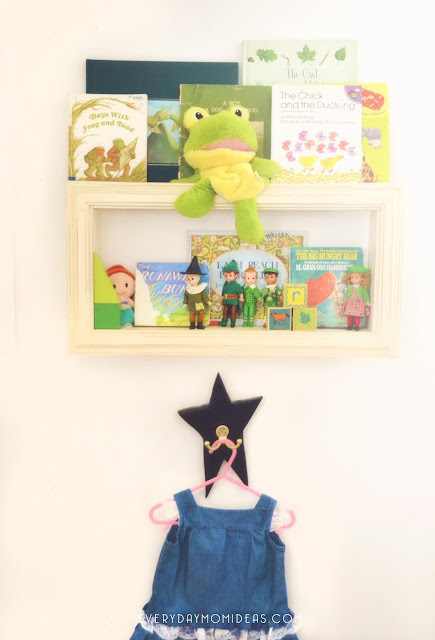 We found these wall racks at Hobby Lobby for a Steal and it was the perfect horizontal addition to his little book nook there. He can also draw inspirational book quotes around one of the book racks, and add word art which I love. 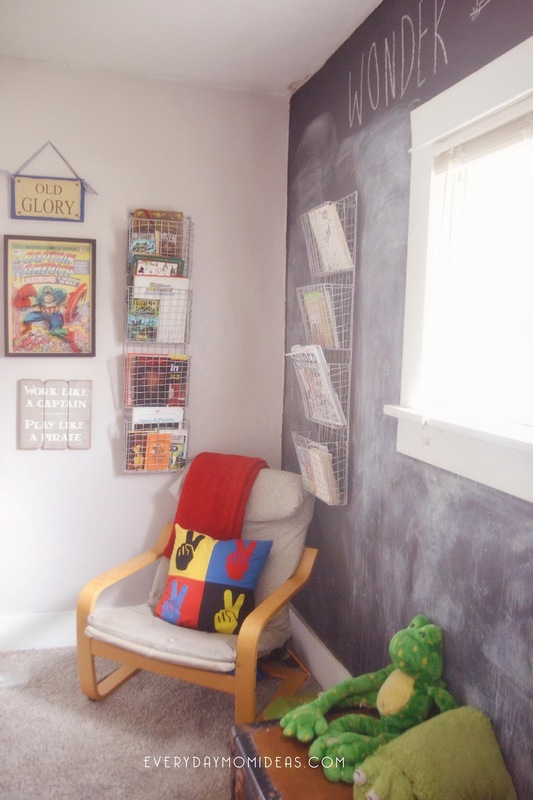 You can take a photo tour of his room here at this previous post we did of his room makeover reveal and get to see what this used to look like. Last but not least is my fireplace mantle. This is by far my favorite place to decorate. 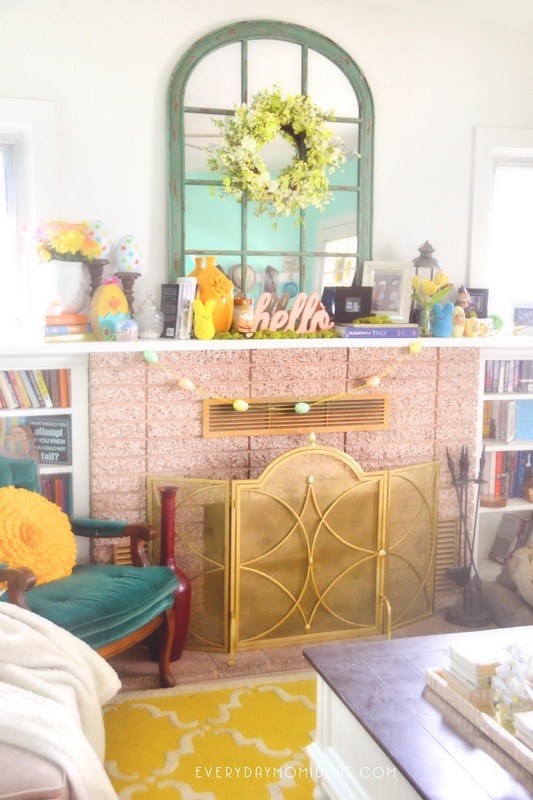 I love changing out this mantle every season and holiday to keep it fresh and interesting. I have a small collection of children's classics that are novels that I have collected over the last few years for super bargain prices. I love shopping yard sales and thrift stores for beautiful old books. Also another great place that you might not know of to get cheap beautiful classic books it Seagull Book. I got that darling orange Adventures of Huckleberry Finn for like a few bucks. They get some crazy good deals at Seagull Book, but the books go fast when they are that discounted. So run fast when you see they are on sale. 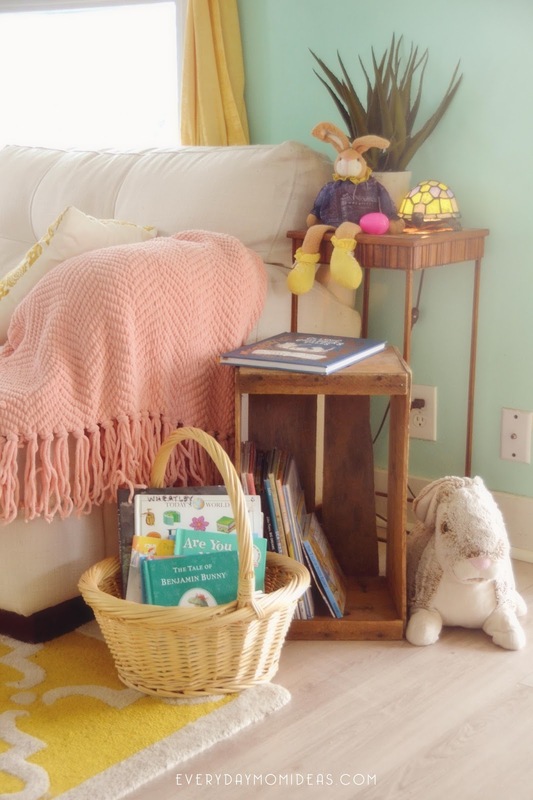 I hope you enjoyed our little children's book tour of our home this Spring and I hope it inspires you and helps you save some major bucks on decorating. Have A Verry Hoppy Easter!!!!! 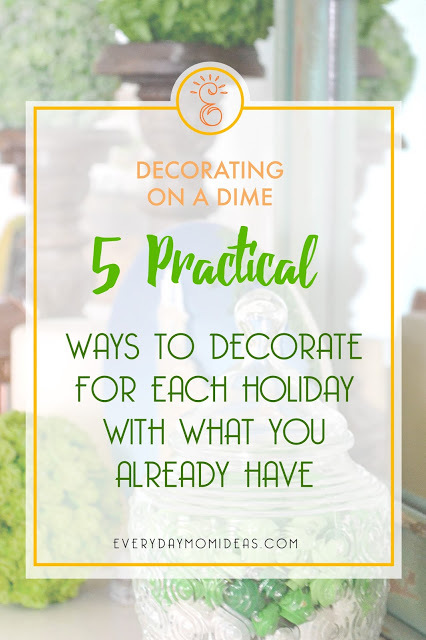 Please share this Pinterest friendly image below with your friends and family or save it for your spring decorating next year. Thank you.